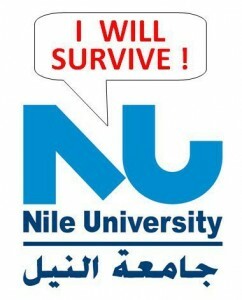 Since last year the fate of Nile University, Egypt's first research university, has been uncertain. Its purpose-built campus has been “conceded” to the Zewail City of Science and Technology, an initiative of renowned Egyptian-American scientist and 1999 Nobel Chemistry Prize winner Ahmed Zewail. Nile University had been scheduled to move to the campus at the beginning of 2011, but when Mubarak was toppled from power, it was announced that the land and buildings would instead be allocatd to the Zewail City of Science and Technology. Nile University has suffered because of its association with Ahmed Nazif, a former prime minister who last year received a one-year suspended sentence on corruption charges. It has been argued that by reallocating the land the state was “rectifying” the situation. However, Egypt's netizens are almost unanimous in their condemnation of the move. Nile University, Giza, Egypt. Image by Mahmoud Allam, Wikimedia Commons (CC BY-SA 3.0). In 2000 The Zewail city of science and research’s corner stone was set up in a location in 6th of October area and 300 acres were allocated to that project. It was too good to be true then the project faced a lot of red tape and bureaucracy and in the end Zewail left and returned back to the States. […] Now after the ousting of Mubarak and during the good old days of PM Essam Sharaf, we found out that the old project of Zewail is resurrected again in which for sure is something great but there was a price: wiping out the Nile University (NU) and merging it inside the new Zewail city without even recognizing its achievements. 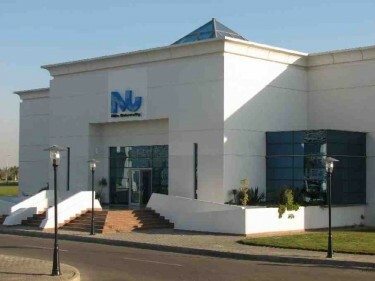 Zewail will take the NU, its students and researches for no price at all!! The buildings of those 127 acres re-allocated to NU are now part of Zewail city. Not only that, but the buildings and the NU facilities were closed for months in front of the NU students with no regard for their researches!! The claim that this building belonged to Dr Zewail's project is untrue. After he layed the foundation stone in 2000, the project stopped and no one was undertaking any building or other work. The land was desert until the Ministry of Telecommunications bought it in 2003, and the photos taken in 2004 confirm that. What is also interesting is that these photos prove that the location of the foundation stone of the the University of Science and Technology (Zewail University) which was laid in 2000 actually lies outside the limits of Nile University site. الأنكى أن زويل الذي يواجه بحملة علمية من جانب علماء مصريين محترمين في جامعة النيل لم يمنحني شخصيا حتى الأن مبررا واحدا مقنعا لأصدق أنه غير راغب في إزالة هذا الكيان العلمي القائم منذ خمس سنوات ويحقق نجاحا مشهودا […] هو فقط يرغب في هدمها قبل أن “يتلكك” ويعود من حيث أتى إلى الولايات المتحدة الأمريكية التي يحمل جنسيتها. 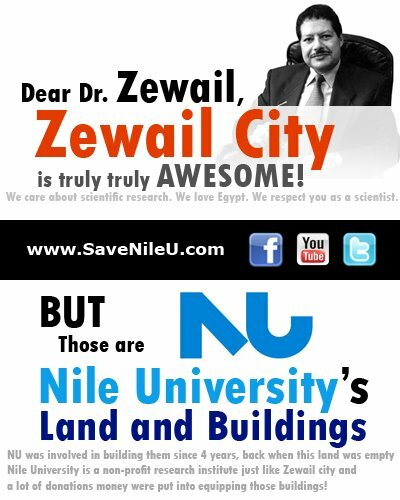 The worst thing is that Zewail, who is facing a campaign from respected Egyptian scientists at Nile University, has not until now provided a single convincing reason to make me believe that he is not willing to dismantle this scientific establishment that has been in existence for five years, and is achieving noticeable success. […] He just wants to destroy it [Nile University] before he “hesitates” and goes back to where he came from, to the United States where he has citizenship. هناك اعتقاد لدي المسئولين في جامعة النيل ووزارة الاتصالات أن مدينة زويل انتزعت منهم الأرض والمنشآت التي أقامتها جامعة النيل, رغم أن الحقائق تقول أن الأرض كانت مخصصة من البداية لمشروع زويل وهناك نصب تذكاري فيها يؤكد ذلك.. The students and the researchers have launched a big campaign to Save NU whether online or offline through protests and sits in. Here is the official Save NU website and its official FB page. They do not want to be a part of the Zowail city. @HebaShalaby: As long as your cause is righteous, and you're doing your best, you have nothing more to worry about.